Hosting a SALTOPIA Artisan Infused Sea Salt tasting can be as simple as offering a slice of cucumber or apple with our salts! The salts sell themselves if you simply offer a taste! Always have your guests seated at a Casual Dinner Setting. The most important part of hosting a SALTOPIA salt tasting event (as a simple tasting or a more extravagant tasting), is the casual dinner table setting! It's key to have each and every guest seated at a table. This setting is most important for many reasons. First, this set up creates a "dinner time" environment where guests are prepared to sit, eat and enjoy. This arrangement also allows for your samples and trays of SALTOPIA salts to be passed by your guests "family style." 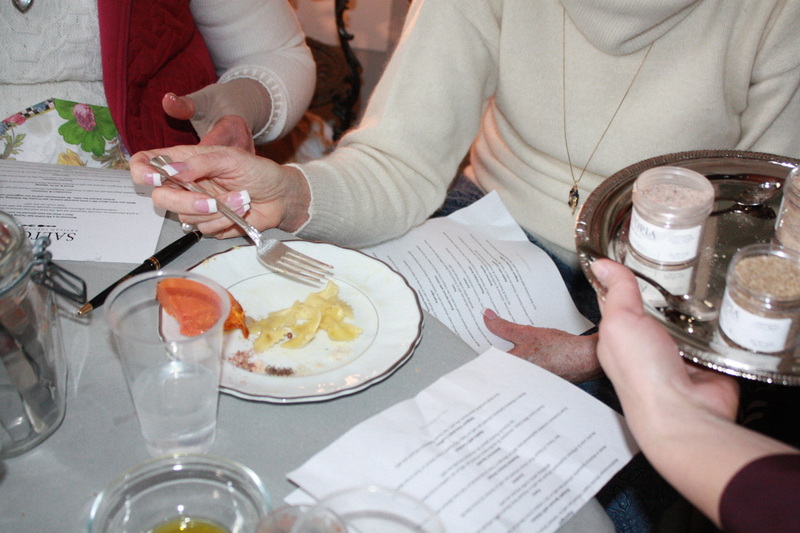 Passing dishes and trays of SALTOPIA salt samples immediately incorporates your guests into the event and engages them in the experience. This seating and setup is also part of SALTOPIA's Mission: bringing folks back to the dinner table to enjoy time together as loved ones. Any setting, at any table size, indoors or outdoors will be beautiful. Feel free to work with your hosts to add their own personal flare and touches. No matter how simple the setting or extravagant, all you will really need are dinner size plates, a fork, a knife and a glass for water. If you choose to offer other drink options then add to your glassware accordingly. No matter how simple the samples are, serve them on a single platter so guests can serve themselves then pass the dish to the person next to them. On the left side of your Friends & Family sales folder, you'll have a tri-fold brochure with an official SALTOPIA pairing chart. 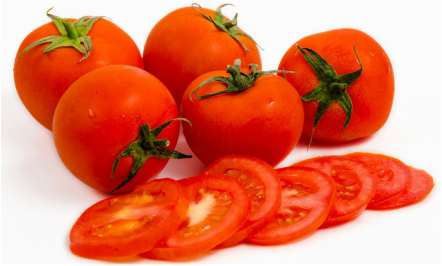 We include simple, affordable food items that can easily create the perfect tasting even with little to no effort, as well as a very small out of pocket investment on foods. A single large cucumber and two apples can easily suffice plenty of sampling for 10-12 guests. Here are some of the items we also include on our pairing chart. For further, simple pairing details, please refer the pairing chart. 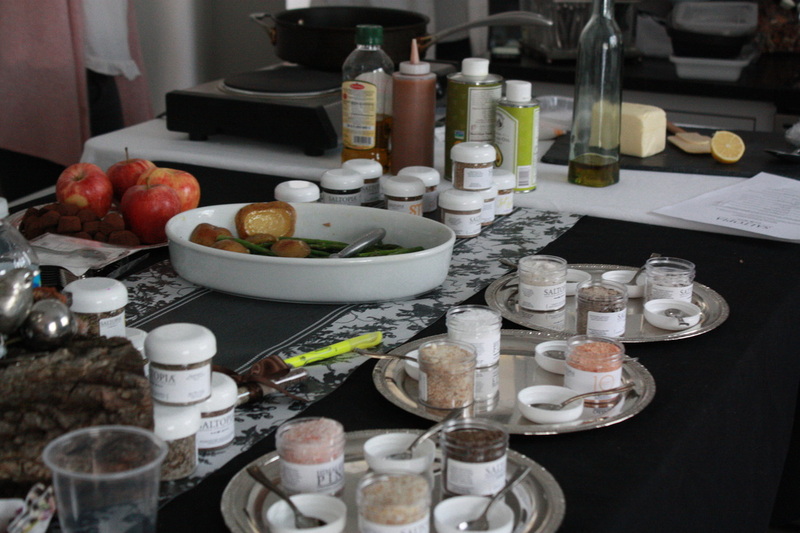 Predetermine which SALTOPIA salts go best with each food sample you plan to pass. 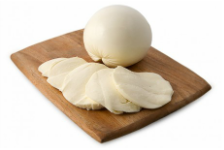 Start passing the SALTOPIA samples directly after the food samples are passed to keep your event moving. Prepare your SALTOPIA salt samples to be passed on plates or trays with sampling spoons provided within your kit. Once the sample dishes make their way back around the table to where you are, you can restock the plate with the new sample for the next round of tastings. Also, don't forget to provide your guests with a menu/list of all the SALTOPIA salt samples being shared and a pen to take notes. We provide a sample menu within your sales kit and you can recreate any rendition you feel comfortable offering. Guests love "starring" their favorites from their tasting for ordering later! - If you, the F&F member is asked to offer a multiple course tasting event for guests and the guests will be paying for their place at the tasting; then you the F&F member is NOT allowed to bring alcohol. If the guests are paying to attend the tasting event, the F&F member is never allowed to provide or include alcohol in that price per person. This ruling doesn't matter if the guests are friends or family of the F&F member. We cannot include alcohol in the sale of any of our events or tastings because we do not have a liquor license. F&F members are welcome to offer their tasting events BYOB. Tastings have become incredibly popular for all types of celebrations from birthdays to anniversaries. By offering multiple courses, you can also request a cost per person based off he menu you prepare. When and if you're interested in hosting private tastings events with multiple courses, you can use our "Multiple Course Sample Menu" as a guide to kick off your event planning. As the Friends & Family Member and SALTOPIA specialist, you will be dedicated to creating a VIP tasting package at a cost per person depending on the menu items selected. 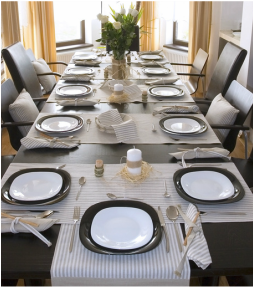 You can offer these events in the privacy of the hosts home, a reserved room at a restaurant or banquet hall - the choice is based off your needs. Please don't hesitate to contact us for advice on how to make certain your event will run smoothly! We have loads of experience and advice! 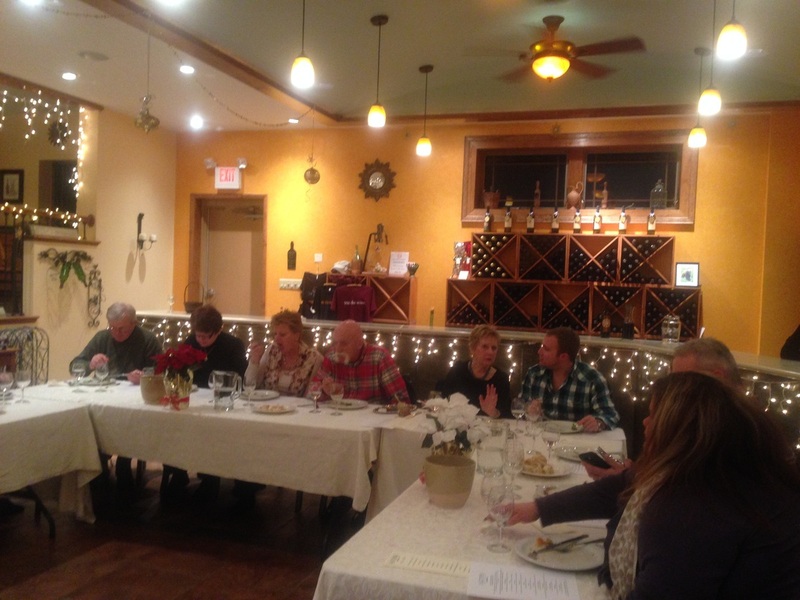 Here are images from a tasting event for 22 people at a small vineyard. 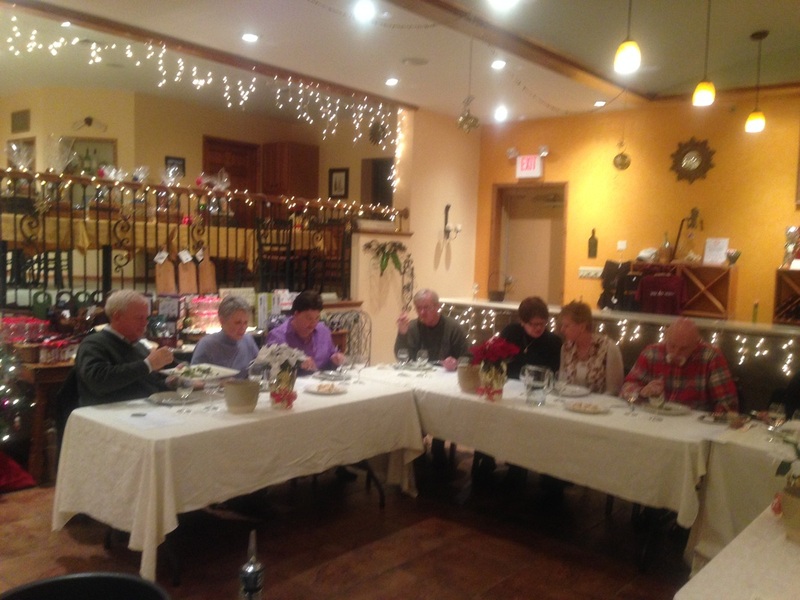 Each customer paid $78.00 per person for 10 courses of food paired with SALTOPIA Sea Salts and wine from the vineyard. It was a wonderful event! We set the guest tables up in a "horse shoe" style setting so that everyone could see both the cooking and the wine explanations each round. Again, the family style passing kept all guests engaged and there was virtually no "serving effort" on behalf of the SALTOPIA Friends & Family representative. 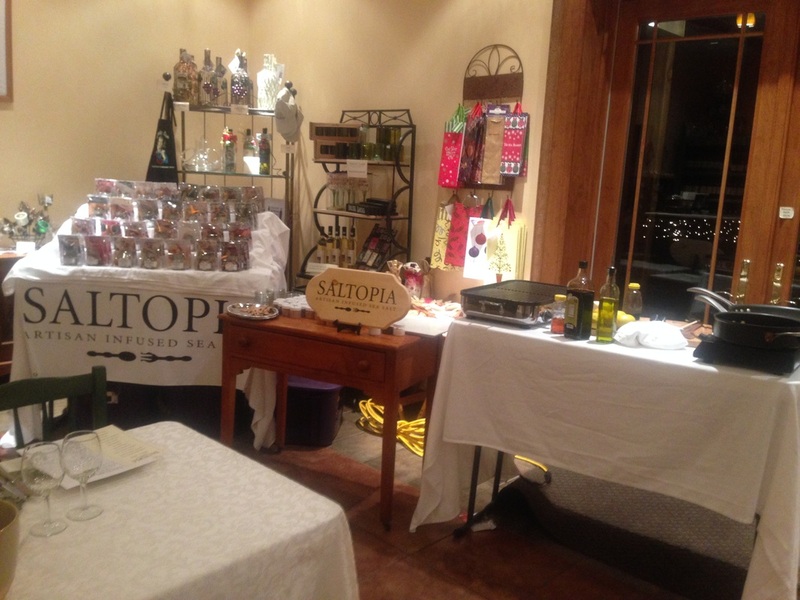 We then took sales orders for SALTOPIA products once the tasting event ended. See our sample menu within your sales kit folders or here for reprinting. The only items needed to cook the food samples during the tasting were a small electric cook top, two saute pans, olive oil, unsalted butter, lemons and spatulas. Cook tops are available at any home goods stores and range between $30 - $70 in price. It's always best to arrive well in advance of the start of a multiple course tasting event to make certain you have an electric outlet for your cook top. 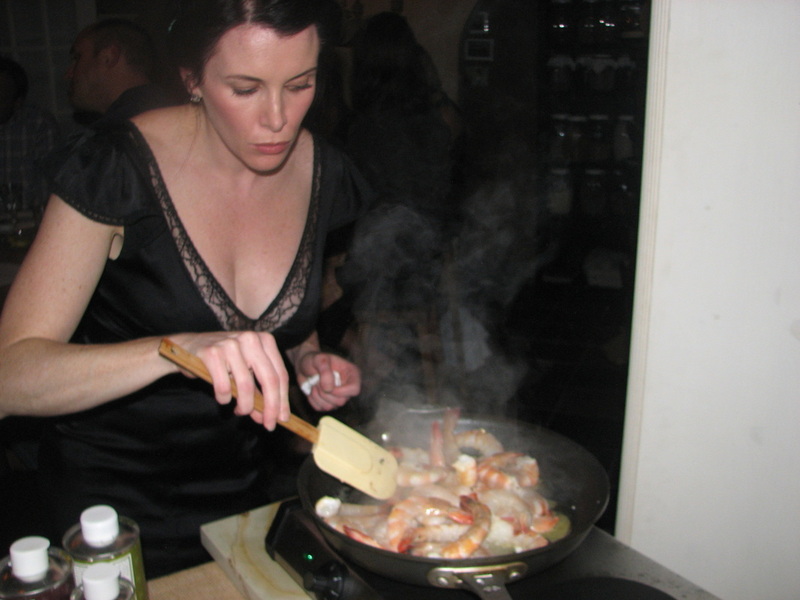 Test your cook top to make sure the outlet works and will not fail during your tasting event. Also be sure you have platters for family style serving and utensils for serving. You can easily reuse the same platters for multiple rounds. Wash in between rounds if need be. Here are a few images from a private, smaller tasting. 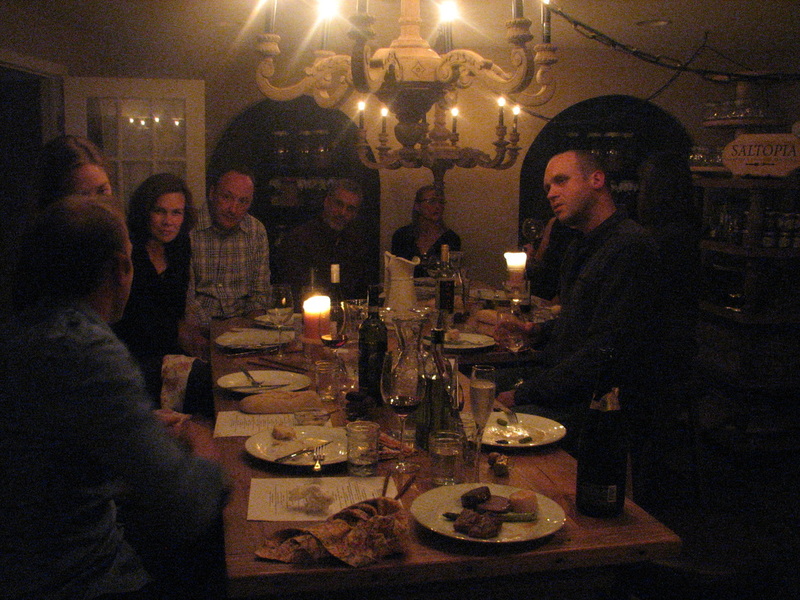 There were ten guests total and it was a wonderful evening with 12 rounds of food! The guests brought their own wine to share with each round. See our sample menu within your sales kit folders or here for reprinting. Always remember that any "Tasting Event" is exactly that: "A TASTE" of food or small sample. When selecting menu items and planning in advance, keep in mind that you won't need a full plate of any specific item per guest. 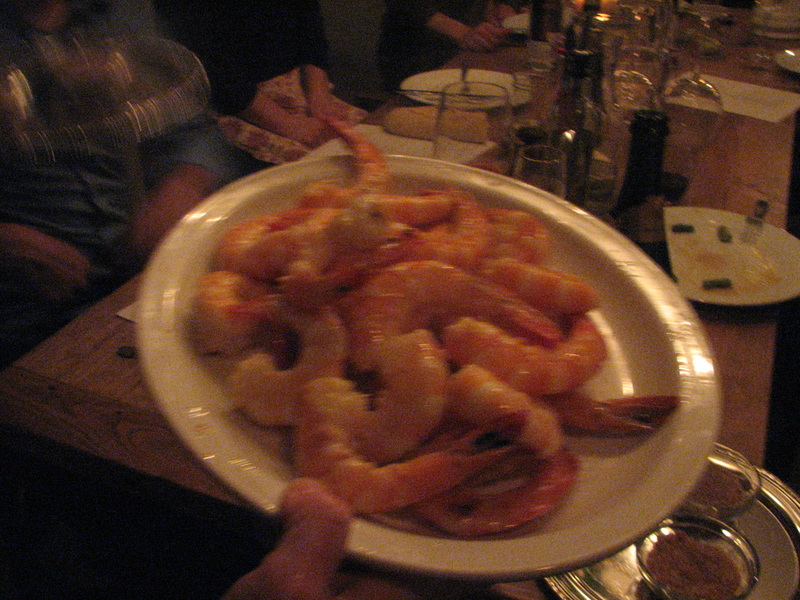 For example, if you and your host select shrimp as one of the rounds, then 1-2 shrimp per guest is ample. Your main goal is to encourage the guests to taste the foods without SALTOPIA and then try the foods again with the recommended SALTOPIA salts as they are passed. Be sure you establish this goal in advance of any tasting event before the official eating begins!